The Cycling Delivery Plan published for consultation in October 2014. The DfT published a Cycling Delivery Plan just a couple hours before MPs debated (again) the Get Britain Cycling inquiry recommendations in October. Earlier today, the DfT held a live but moderated ‘webchat’ to answer questions about the plan. For the past month, they have been doing a tour of the UK – which did not stop in London – to collect responses in person. The consultation closes on the 13th November. In a nutshell, I don’t think the delivery plan delivers. I read your ‘Cycling Delivery Plan’ which was published just hours before the Parliamentary Debate on Get Britain Cycling. It must demand much, much more funding for cycling in a much, much shorter timeframe. The Department for Transport released the statistics on road violence which show a marked increase in the number of people killed or serious injured: up 40% over the average. Robert Goodwill, the Cycling Minister, revealed that just 0.71% of the total DfT budget has been spent on cycling over the past 5 years. In today’s DfT webchat, you revealed that spending on cycling was £374m over 4 years. That works out to a miserly £1.46 per person . You claimed in the webchat that “local contributions” bring that figure up to £5pp. However, FOI have revealed that those “local contributions” are allocated to ZERO fully hard-segregated cycle routes. Instead they are likely spent on painted lines or education campaigns of dubious value (ie helmet, hi-viz promotion promotion). In comparison, the HS2 trainline is to cost £42.6bn for 330 miles of track, plus a further £7.5bn for the trains themselves. Another comparison: the DfT is to spend £15bn for 100 road upgrades which have little in the way or road danger reduction for people that choose to cycle. The present parliament is spending £9bn, for a total of £24bn. Campaign groups like ‘Stop Killing Cyclists’ are demanding that you invest £15 billion in a National Segregated Cycle Network over the next 5 years. That works out to £46.80pp which would bring the UK up to the standards seen in The Netherlands. This isn’t new funding but a reprioritisation of existing funding. The DfT stated that the main benefits of the current, relatively small amounts invested in cycling schemes were: improved physical fitness, journey quality and decongestion of the roads. Your Cycling Delivery Plan must be rewritten to state that £15 billion is invested over the next 5 years in a segregated bicycle network throughout the UK. Cycling funding is truly an investment with a high rate of return. – Stop the Killing of Pensioners from excessive speed. – Stop the Killing of Cyclists. – Stop the Killing by HGVs. – Stop the Killing without liability. – Stop the Killing from Lung, Heart and other Diseases caused by vehicular pollutants. – Stop the Killing at Junctions. – Stop the Killing from CO2 emissions from impacts of the climate crisis. – Focus on Life! Transport governance must make safety and quality of life the top priority. Below is a graphic that the Highways Agency created and the Department for Transport promoted in a tweet back in August (and the Prime Minister referred to in his speech to the CBI earlier this week). 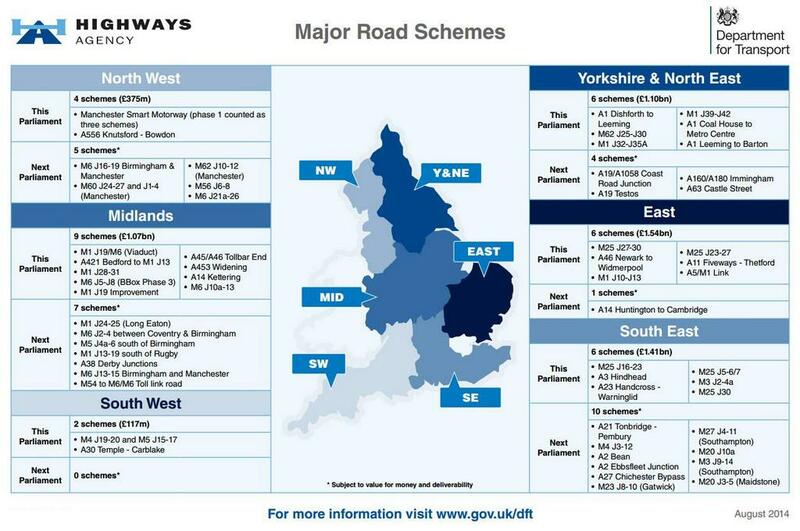 It shows where the £24bn of “investment” in the roads will be made. Infographic showing where £24bn is to be spent on road schemes in this and the next Parliament. Click for a larger version.